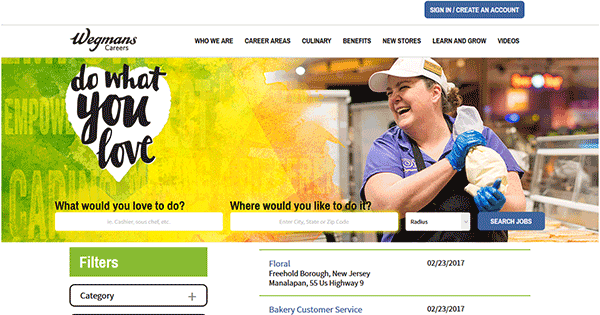 Use the guide on this page to learn how to complete the Wegmans job application online. Numerous career areas can be applied for online including corporate, retail, distribution, hospitality, and supply chain positions. About the Company: Wegmans is a grocery store chain with over 90 locations throughout the Northeast/mid-Atlantic regions of the United States. The company is based out of New York, and was founded in 1916. 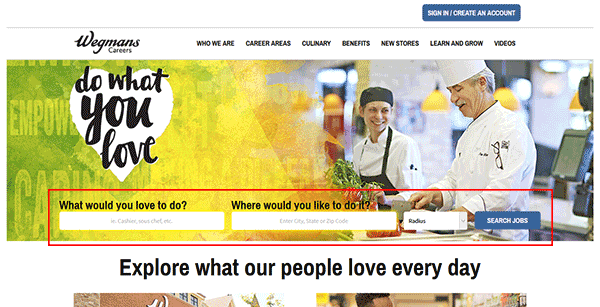 Step 1 – Click here to go to the main careers/jobs site (link will open in a new browser tab/window). Step 2 – Fill in the search form by entering a keyword (e.g. job title) or location (city, state, or zip code). Hit the “Search Jobs” button to load the results page. Step 3 – The results can be filtered by category, state, city, address, or schedule (full or part-time). 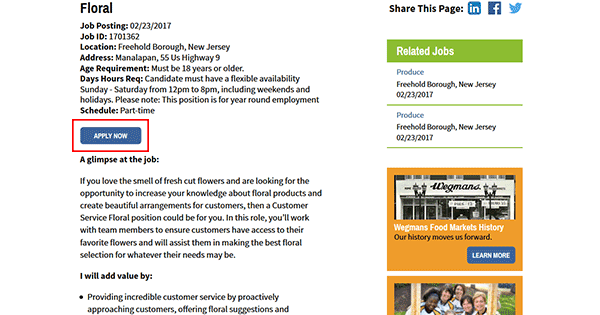 Click the title of the job you want to start the application process for. Step 4 – Read the job description, qualifications, etc. and then press the “Apply Now” button (outlined below). Step 5 – Log in to your account. If you need to register a new account click the “Create a New Account” button. Step 6 – Create a username and password, and then enter your email address.